NCTCOG used the INVEST pilot tool’s System Planning (SP) module in 2012 to score its previous LRTP, Mobility 2035. As part of NCTCOG’s more recent INVEST Implementation Project, the agency rescored Mobility 2035 using the updated INVEST Version 1.0 to ensure the most up-to-date analysis. The agency wanted to use the Mobility 2035 score as a baseline that would enable comparison with its new LRTP, Mobility 2040. 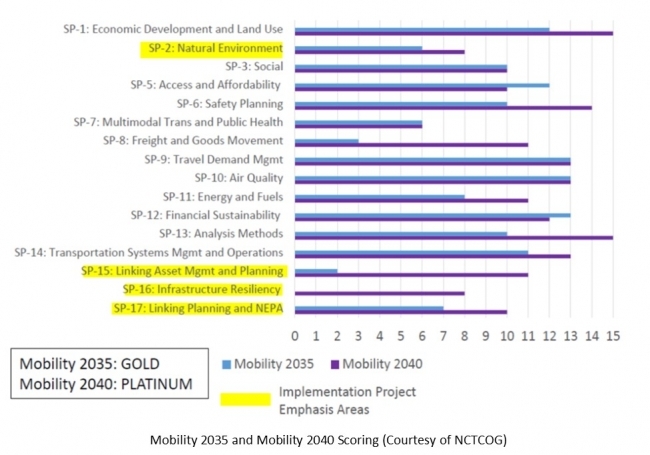 When the second round of scoring concluded in December 2013, Mobility 2035 scored at the Platinum level under the pilot and at the Gold level under Version 1.0. NCTCOG believes that the difference in scores is due to the inability to assign partial credit under Version 1.0. While Mobility 2035 scored lower under Version 1.0, generally the criteria that did not score well during the pilot did not score well in the 1.0 Version. In total, 19 NCTCOG staff participated in scoring Mobility 2035 on the 17 SP criteria. Many of these staff were involved in scoring the plan under the initial pilot, which involved in-person meetings for each criteria. Therefore, staff were already familiar with INVEST and the project team felt comfortable scoring the plan using an Excel workbook. The spreadsheet allowed scorers to answer questions, leave notes, provide supporting documents, and recommend next steps. While staff from multiple program areas met to discuss certain criteria, the overall feedback was that staff liked the spreadsheet format because it was easier to add examples over time. NCTCOG used the results of the Mobility 2035 evaluation to identify emphasis areas to focus on during the development of Mobility 2040. The results indicated that NCTCOG could improve upon several areas, including SP-02 Natural Environment, SP-15 Linking Asset Management and Planning, SP-16 Infrastructure Resiliency, and SP-17 Linking Planning and NEPA. Prior to the 2012 Moving Ahead for Progress in the 21st Century Act (MAP-21), NCTCOG documented performance measurement on an as-needed basis. Results from the Mobility 2035 INVEST scoring showed that, although NCTCOG reported on some performance measures related to the INVEST criteria, these were typically not monitored to demonstrate achievement or results. Based on the results of the INVEST scoring and the introduction of a national mandate on performance-based planning in MAP-21, NCTCOG turned its efforts to introducing additional performance measures into its newest LRTP, Mobility 2040. Increase in the number of regionally funded vanpools operating within the region. NCTCOG also revised its desired performance management nesting structure. In Mobility 2035, a broad goal was linked to related and unrelated policies, which were linked to a performance indicator. In its desired nesting structure for Mobility 2040, a broad goal will be linked to an objective, which will be linked to a desired trend and a performance indicator. At the time when NCTCOG was revising its performance measures, official federal guidance related to MAP-21 performance targets had not been released, and NCTCOG did not want to establish performance targets without this guidance. Moving forward, NCTCOG plans to work with the Texas Department of Transportation and transit authority partners to establish coordinated performance measures and targets. NCTCOG made updates to its Regional Ecosystem Framework (REF) that allow ecological conditions to be assessed and documented more thoroughly in Mobility 2040. The REF is a GIS-based tool that was designed to incorporate environmental considerations during the development of infrastructure projects. REF covers 10 ecosystem layers within three ecological parameters: green infrastructure, water considerations, and ecosystem value. The results helped NCTCOG to identify conservation priorities that will enhance the long-term ecological function of the region. Eventually, NCTCOG plans to overlay conservation data with proposed transportation corridors to identify the corridors’ potential environmental impact at an early stage. NCTCOG expanded the focus on asset management in Mobility 2040, compared to the previous version of the plan. Funding for operations, maintenance and management of existing transportation infrastructure increased 27% in Mobility 2040, over Mobility 2035. In addition, Mobility 2040 includes a new roadway improvement category called Cap/Main. This category is for locations where existing and functional infrastructure can be further optimized to increase efficiency and longevity. Cap/Main projects were identified and prioritized in the plan. NCTCOG also conducted three Cap/Main pilot studies that demonstrate the effectiveness of linkages between asset management and long-range planning. NCTCOG used INVEST as a guide for integrating vulnerability and resiliency into Mobility 2040. A separately-funded FHWA Climate Change/Extreme Weather Vulnerability Assessment pilot study helped determine critical roadway and rail infrastructure in Dallas and Tarrant County at risk from flooding or excessive heat. This pilot project also considered linkages between extreme weather events and the asset management process. An increasing focus on asset management, including identifying Cap/Main projects in Mobility 2040, helped to address mobility and infrastructure resiliency needs simultaneously, as these projects were typically lower cost, quicker to implement, and can more easily incorporate adaptive elements. In Mobility 2040, NCTCOG was able to address deficiencies it identified in the 2035 INVEST evaluation. In particular, Mobility 2040 improved its score in criterion SP-02, Natural Environment, by two points and SP-17, Linking Planning and NEPA, by three points by further integrating the REF into the new LRTP. NCTCOG also dramatically improved its SP-15, Linking Asset Management and Planning, score by increasing funding for operations and maintenance, adding a new roadway improvement category for improvements to existing roadways to increase efficiency, and establishing new capital asset management strategies. These changes resulted in an additional nine points for NCTCOG in the SP-15 criterion. Criterion SP-16 received no points under Mobility 2035; NCTCOG added eight points to this criterion in Mobility 2040 by conducting an extreme weather vulnerability assessment to identify vulnerable infrastructure in the region and incorporating the results into the LRTP. NCTCOG also increased its score in this area by linking its resiliency planning with its asset management and conservation priorities. The figure to the right shows the Mobility 2035 and Mobility 2040 results. The figure also highlights the criteria that NCTCOG identified as emphasis areas. After the Regional Transportation Council adopted Mobility 2040 in March 2016, transportation department subject matter experts evaluated the new LRTP using INVEST Version 1.2. The results showed improvement in the majority of the criteria, and Mobility 2040 improved its score to a platinum rating. The majority of the criteria either had the same or higher score in the evaluation of Mobility 2040, which is consistent with the increased emphasis on elements that did not score high during the Mobility 2035 evaluation. Evaluating a prior LRTP using INVEST allowed NCTCOG to identify weaknesses and focus on improving these weaknesses when creating the newest LRTP, Mobility 2040. Using INVEST allowed for greater collaboration, education, and partnership on evaluation and creating performance measures. INVEST helped NCTCOG to develop performance measures within the MAP-21 framework and integrate these performance measures into the new LRTP. NCTCOG plans to continue using INVEST to track the sustainability-related performance measures that were developed in conjunction with Mobility 2040. This effort will be coordinated with the development of federally-mandated performance measures and targets. NCTCOG staff is interested in looking into what programs or projects could be evaluated using the other INVEST scoring modules. NCTCOG provided vital feedback to FHWA on the pilot version of INVEST that was addressed as part of Version 1.0, including the opportunity to add notes, supporting documents, and next actions to each criterion. As part of the recent INVEST evaluation, NCTCOG has also provided additional recommendations on improvements that can be included as part of future versions of the tool.